Solo fingerstyle guitarist Robert Keyes draws his musical stylings from a multitude of different genres. Jazz, Blues, Classical, Country, Contemporary, Classic Rock, etc. He draws no boundaries! Notables among the long list of musicians he has played with are Lyle Lovett, John McVie, Hagood Hardy and Holly Cole. 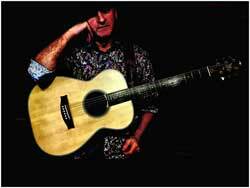 Since 1984, Robert has doggedly pursued the challenging, but rewarding art of solo guitar. Since moving to this area from Virginia in 2013, his enthusiasm in performing, humble attitude and easily identifiable sound, have kept him very busy.